TotSoc has a Data Protection Policy which affects members - you can read it here. Following the very successful illustrated talk by Barrington Weekes in 2016 we are delighted to welcome him back again. The AGM will be held at the Totnes Cinema in the High Street on Thursday 18th October, starting at 7pm. The talk will start promptly at 7.30pm. 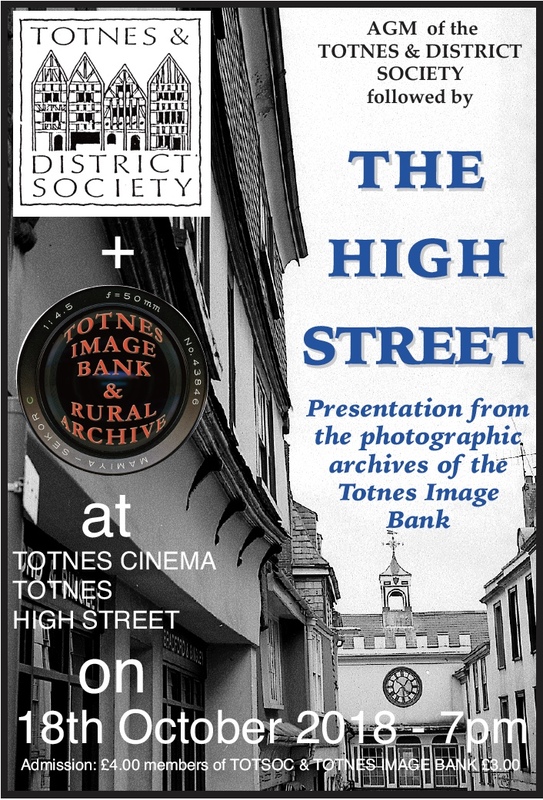 TOTSOC and TOTNES IMAGE BANK members £3.00, non-members £4.00 on the door. Please come along and bring some friends too for what promises to be an extremely interesting, informative and entertaining evening. Minutes of the bi-monthly committee meetings are now on the website here. We are writing to you from Stoke Gabriel low-e group, originally set up as a Transitions Streets group in 2010. We aim to promote and encourage energy saving, sustainability and renewable energy within our parish of Stoke Gabriel and the South Hams. When a housing development of 43 homes was planned for our village and the developer withdrew the original plans to fit solar thermal panels, the group referred to South Hams District Council's policy document, the Development Plan document, Section 4 (DP4), on sustainable construction which states that developments of 10+ dwellings must supply 10% of their energy on site from renewable energy sources. Representations from our community group to South Hams District Council prompted the planning office to implement a new planning condition requiring developments in the South Hams to comply with this policy requirement. Developers now have to supply an Energy Statement with their planning application stating how this requirement will be met. The low-e group focused on the renewable energy requirement, however, DP4 (copied below) also contains many other excellent provisions on sustainable construction that are not all being implemented. We would like to join with individuals and community groups across the South Hams to lobby for all the provisions in DP4 to be implemented in full to ensure that planning policy on environmental protection, quality design and sustainable construction are always required by South Hams District Council. We think that our success with renewable energy was due to the fact that we were only asking for the full implementation of existing South Hams policy. As planners have to reconcile the needs of developers, the need for new and affordable homes and meet national housing targets, the environmental standards in their own policy can lose out. However, our experience shows that when we raised the profile of the environmental requirements and asked South Hams District Council to fully implement the environmental provisions set out in South Hams policy, the officers were able to assign it higher priority. So we believe that this is something well worth doing to ensure that the South Hams will build only well designed, sustainable developments that benefit the community. The low-e group would be happy to support groups or individuals undertaking this work, which can be carried out in a number of ways; firstly by responding to planning applications as they come up in your area, and secondly contributing to your local master plan, development brief, neighbourhood plan, parish plan or village design statement. If you are interested please contact us, and if you have any contacts with community groups who may be interested please forward this letter. Development comprising 10 or more dwellings should meet "Lifetime Home Standards" on at least 25% of homes. The TotSoc submission on the Draft National Planning Policy Framework can be downloaded here. The new edition of Contact can be downloaded from the Archive page. This new media statement can be downloaded here. Paul Bennett and Louis Victory of TotSoc are two of the authors of a report on the plans for the redevelopment of Baltic Wharf. The report can be downloaded here.